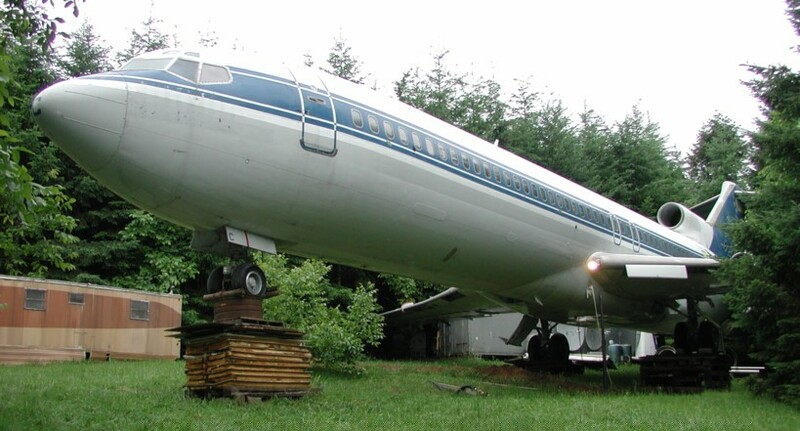 An option to a new $200K stick home: A used multimillion dollar aerospace quality home. economical to build (although geodesic homes are too). due to a few missing floor panels, so watch your step at all times. clothing is best. Directions to my home are provided here. suggests flying the 317° radial and view left. wasn’t great – but yours could be. terrific place for a rare epiphany or two, or romance. freight holds, which I suspect provide stand up room ceiling heights. out, awaiting destruction, and the roominess is absolutely remarkable. bargain. But I’d like a corner lot for myself. structures that mankind has ever built. cardboard, using ancient and inferior design and building methods. other over the edge of the nearest cliff. The real reason: It’s a great toy. Trick doors, trick floors. interior refinement and polish items. the edge of the pillars in a severe earthquake. The water system can probably be used essentially as it is. and I now have the mating connector. sewer lines to provide gas venting. canister, so controlled air exchange is required to avoid suffocation. the duct network to nearby cooler walls. acquire or build a 60 Hz to 400 Hz power converter to facilitate that. that is, essentially one large room. I’m single and live in the woods. better view through the windows. band saw, because it’s an unmanageable source of dust sized debris. I can put it back in, but that seems unlikely at this time. * How well does the original insulation perform? : I don’t know. this is not a high priority item for me. necessary without delay – we can’t afford to react out of fear. This entry was posted in spectre and tagged DIY, real estate, tech by secret santa. Bookmark the permalink.